A tricing pendant is part of the rigging that allows lifeboats to be launched. The system to launch a lifeboat is complex and the tricing pendants play an essential role if the ship is heeling or laid over because of damage. Next small twin cranes called Davits are brought into the launch/recovery position. Each Davit is equipped with a powerful winch and emergency manual brake. These Davits are fitted with hoisting lines called Falls which attach to the lifeboat harness which is in turn fastened to the gunwales on opposite sides at the fore and aft of the boat. Lines attached to the bow and stern of the lifeboat are called Frapping Lines and are used to control the movement of the boat as it is lowered or raised. An additional line is attached to the bow of the lifeboat to keep it near the ship after all other rigging has been released. This line is called a Sea Painter. Under the boat, usually attached to the keel, is a device called a McCluny Hook which allows lines attached under the boat to be released remotely. The lines attached to the McCluny Hook are routed to the Tricing Pendants which are an apparatus used to pull the lifeboat to the embarkation station when the ship is at an abnormal angle. 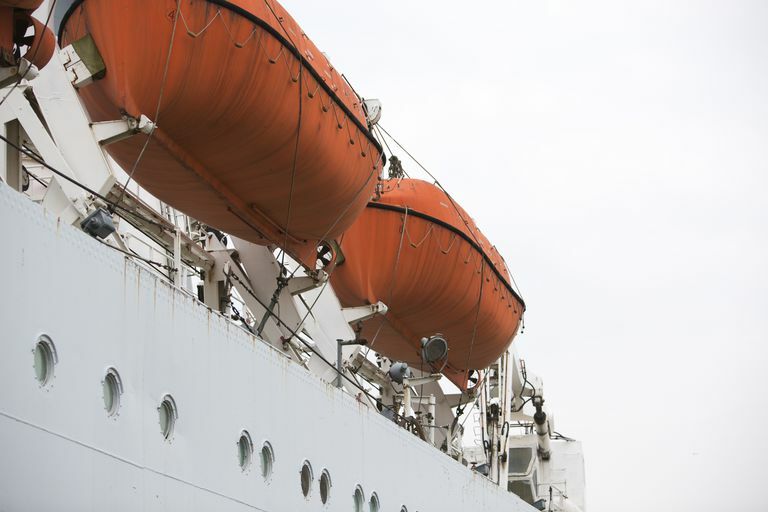 If lifeboats were lowered while the vessel is heeling over from the damage they will either slide down the side if they are on the high side or enter the water far away from the embarkation station if they are on the low side. It's very easy to be injured in a lifeboat. The Costa Concordia wreck off the coast of Italy is a prime example of the dangers of evacuating by lifeboat. At least two people died on the wreck because they attempted to swim to the rocky shore rather than risk the poorly deployed lifeboats. A tricing pendant is a device that is made up of three main components. The length of line or chain that is attached to the keel of the lifeboat via a McCluny Hook, a block and tackle system that increases mechanical force, and the lines and often winches that draw the lifeboat close enough for passengers to get aboard. There is an ongoing controversy surrounding SOLAS Conventions as they pertain to lifeboat training and drills. For safety reasons, SOLAS compliant vessels cannot have occupied lifeboats during launch or recovery. Lowering manned lifeboats is very hazardous to everyone involved and there are many deaths and injuries from lifeboat drills. It's a very different experience to lower a lifeboat with operators than it is to lower an empty lifeboat. This is true for the crew who will ride down in an emergency situation and for the crew running the Davit winches above and tricing pendant gear at the embarkation station. SOLAS is probably right to try and limit training injuries, but without realistic training that is used for emergency evacuation of the vessel, there is little hope for competent launch and recovery of lifeboats in a bad situation. Some ships continue to carry out lifeboat drills with a mix of skirting the rules and using allowed activities to replace prohibited training. This will result in some skills but not the best skills. To have the best training for your crew they must be exposed to the most realistic training available and that means manned lifeboat drills. If SOLAS is to be amended it will take many voices to overcome what is generally seen as a hindrance to safety training. Speak up directly to the IMO or email here and we will pass the comments along.